This is Windows Automation Made Easy. The only solution with VBScript, Image Recognition, Text Capture, Custom Dialogs, an easy to master automation language with over 250 actions, full variable support, code builders and debugger and a macro recorder that creates real human code and the ability to create standalone EXEs. Powerful and flexible for the advanced user yet easily mastered by the novice. Save time and money and put your PC to work. ...... technology such as Screen Image Recognition and Screen Scraping Text Capture. More than 250 actions and standard programming constructs include the ability to send keystrokes and mouse events to other applications, wait for and activate windows and screen objects, perform internet tasks, run programs and commands, execute files, read from and write to files, copy, move and delete files, control applications with DDE, control Office apps, use VBScript, ActiveX/COM objects, access DLLs and Win32 functions, import, extract, convert and transfer data, even create interfaces with the built in Dialog Designer and more. A full featured, easy to use, editor, code builders and a debugger aid script creation. 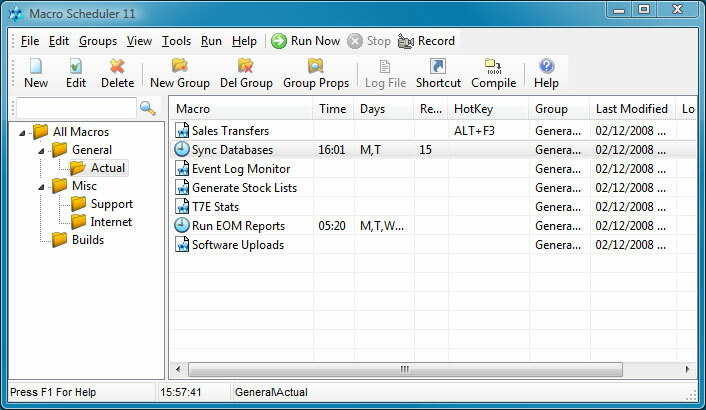 Use Macro Scheduler Automation Tool Pro version to compile scripts into standalone EXE files which can be launched on any Windows PC. Qweas is providing links to Macro Scheduler Automation Tool 13.0.03 as a courtesy, and makes no representations regarding Macro Scheduler Automation Tool or any other applications or any information related thereto. Any questions, complaints or claims regarding this application Macro Scheduler Automation Tool 13.0.03 must be directed to the appropriate software vendor. You may click the publisher link of Macro Scheduler Automation Tool on the top of this page to get more details about the vendor.